...and it should remind us of the relationship between freedom and the consciousness of possibility, between freedom and the imagination - the ability to make present what is absent, to summon up a condition that is not yet. ...and what is good, Phaedrus, and what is not good... need we ask anyone to tell us these things? Wow, its been a long time since i've posted here. The real reason is that I really don't read blogs too much anymore - perhaps you don't either. I've been re-envisioning this site as more of a resource website in the future, but just haven't found the time. In the meantime, I've found very little concise information on post-modernism in film, and so I wrote this summary up for my IB Film class. If its helpful to you, please pass it on. If you have something to add, please let me know. Postmodernism is, among other things, pretty slippery. Modernism is the belief in a metanarrative. A metanarrative is an agreed upon belief that there is an immutable system that makes sense to us that guides our lives. Organized religion, political systems, and econmic systems all rely on a metanarrative. Postmodernism is a rejection of the metanarrative. Although some people argue this one way or antoher, postmodernism is neither good nor bad. It is simply an awareness that the systems that we have put in place as a civilization will not necessarily progress forward ad infinitum. It is somewhat of an unsettling state to be in - it describes a world that is uncertain, a world in which any closely held belief can be challenged. It can feel bleak because it suggests a world without greater meaning - or it can be empowering because it gives us an opportunity to create our own meaning. Pastiche: Pastiche mimcis the style of pre-existing styles. Wes Anderson pays homage to the French New Wave as Tarrantino pays homage to everything from the Western to Japansese jidaigeki (Samurai) films. You might think that this is him just ripping off those that came before them, but then you might also embrace the postmodern idea that Everything is a Remix*. Example: Inglorious Basterds is a WW2 revenge fantasty - but it is done in the style of a Spaghetti Western film. It also questions objective truth in that it totally rewrites the end of WW2. Self-Referentiality: Any film or TV show that breaks the fourth wall is acknowledging that it is aware of itself- Parks & Rec, The Office, Modern Family. Deadpool acknowledges not only that he's a character in a film, but actually argues that his sequel should be better than another film franchise's and signs an autograph Ryan Reynolds. That is super self-aware. Objective Truth & Epistemic Certainty: Epistemology is what separates a certain justified belief from an opinion. This is often understood as religious belief, but can be explained with any agreed upon belief system. Films like The Eternal Sunshine of the Spotless Mind, Blade Runner, Donnie Darko, Solaris, question whether we can trust that our own memories- even our own existence is real. Conventions (Narrative & Film): What do Monty Python and the Holy Grail, The Sopranos, A Serious Man, and No Country for Old Men have in common? All these films (and TV show) end without explanation. They deny the audience the satisfaction of an ending. In other words, without a conclusion, the audience is denied a reason for the journey... Sounds like a pretty postmodern view of life, huh? Oh also Run Lola Run and Memento messing with narrative structure and stuff. Hey even jump cuts and smash cuts play with time in space in such a way that messes with film form and narrative structure. Simulacrum: The reason that Simulacrum is an important aspect of postmodernity is because it deals with the idea that if we can't accept that our reality is objectively true then we might imagine what lies outside this 'simulation' that we live in. The classic example of this is The Matrix, but The Truman Show is also a great example of a Simulacrum (and a great commentary on Reality TV). Intertextuality / Hypertextuality: Scott Pilgrim is the perfect Intertextual film as it references many aspects of popular culture outside of it (everything from Bollywood to Space Invaders to Seinfeld), but it also uses the conventions of both video games and comic books. What other formats could you adapt to the screen? 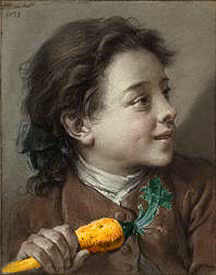 The Carrot Revolution is an art education weblog and a resource page for art educators, art students, and artists in the digital age. Our goal is to fight the tyranny of the ordinary and to liberate from the status quo. Questions, comments, suggestions? Email! dsgran@yahoo.com. Rotoball is an international collaborative animation project for students. Rotoball 2015 is now underway! Head over to our website and join the project! The eighth annual Shanghai Student Film Festival is almost here!